There is a little bit of a gap seeing as the CIF-Southern Section is celebrating its 100th anniversary this year and Mike Smith has been coaching for 26 years. Regardless of the context, the Chino softball coach’s profession of his pitcher’s greatness is a bold one. Miranda Viramontes hasn’t given anyone reason not to believe him, winning a CIF-SS championship in her first season as a starter and carrying the Cowgirls to the brink of another as a junior. On the strength of two postseason one-hitters and a no-hitter preceding Tuesday’s 2-1 win in nine innings, Viramontes (pictured above) has pitched Chino within one win of a second straight CIF championship. In other words, fourth-seeded Lakewood has its work cut out when it faces off with No. 3 seed Chino in the Division 2 final today at Deanna Manning Stadium in Irvine. Try these numbers on for size. In 30 games this season, Viramontes has five no-hitters and five one-hitters. She has 14 shutouts, including two in the playoffs. The junior has won 20 consecutive starts, last losing a 1-0 decision on March 3 to Santa Ana Mater Dei, the No. 2 seed in Division 1. She has a 0.36 earned-run average on the season and has allowed a total of two runs in four postseason games. Viramontes was a hot commodity even before she led Chino to the school’s first softball CIF title as a sophomore. She verbally committed to Utah following her freshman season. A few months later, she was the centerpiece of a CIF championship team. Last season, a 10-6 win over Mt. Baldy League rival Don Lugo in the title game produced a line score that was the exception. As a sophomore, Viramontes allowed a total of four runs in Chino’s first four playoff games. The Cowgirls needed every bit, considering its second-round and quarterfinal results were one-run victories. Their opponent in last season’s 2-0 semifinal win that propelled them to the championship game? Lakewood, tonight’s opponent. From the outside looking in, Chino was a natural candidate to reach another championship game, but the team that will take on Lakewood tonight is very different that the one whose picture adorns the walls at Chino. Despite the team’s 30-2 overall record, four freshmen dot a lineup that has taken time to develop this season. The Cowgirls graduated three players last season that are on college rosters, but didn’t replaced them with experience. Luckily, there are some holdovers well suited to give advice about pressure situations. On Tuesday Viramontes pitched her team to its fifth playoff victory in the last two seasons by two runs or less. Whatever Chino is doing, it has been working. The Cowgirls haven’t lost since dropping a 7-6 game to eventual Division 2 top seed Mission Viejo March 9, a game Viramontes didn’t pitch. Lakewood knows a little something about pitching and defense. Since its first-round win, the No. 4 seed has allowed a total of one run in three games. Offense figures to come at a premium on Saturday. But close, low-scoring playoff games are nothing new to Chino. This entry was posted in Mt. 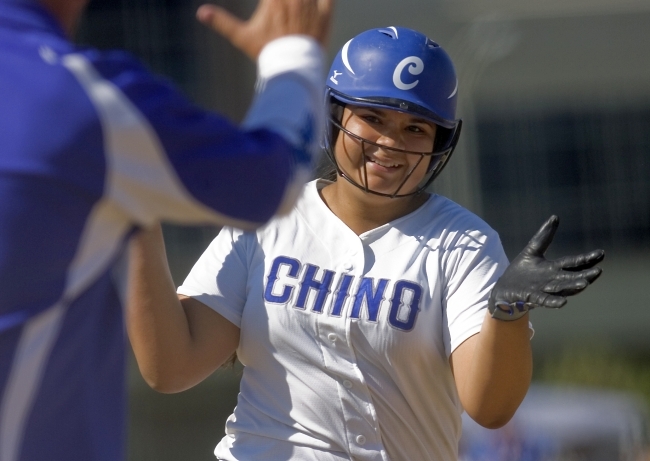 Baldy League and tagged Chino, prep softball by Clay Fowler. Bookmark the permalink.